Get in on the great savings waiting for you at participating AMC, AMC-DINE-INTM and AMC CLASSICTM theatres. Save big on tickets to Tuesday showtimes! * It’s just a weekly reminder of the many perks of being an AMC Stubs® member. No matter how you served, we’re proud to serve you. 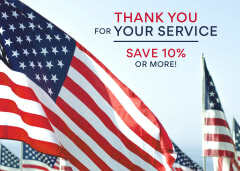 Show your military ID at the box office and save at least 10% on an evening ticket. Savings are available at box office only. Participating theatres only. Discount available with valid photo military ID and applies to standard evening price only. Surcharges for premium formats and special events. We are proud to offer discounted pricing for students, members of the military, seniors and AMC Stubs members at our participating theatres! Bring your student ID to the box office and check if your favorite AMC theatre will help you save with your school pride! Bring your military ID and see how much you can save. It’s our way of saying ‘thank you’ to all of our service members with discounted ticket prices at participating theatres! Spend your golden years with the silver screen. 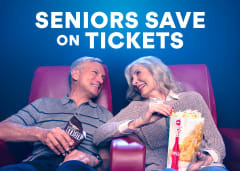 Guests aged 60 and up can get discounted ticket prices at participating theatres! Available online and in-theatre at participating locations. Discount applies to full-price tickets for Tuesday showtimes only. Discount varies by location. AMC Stubs member number must be present on the transaction to receive discount. Surcharges for premium formats and special events. Exclusions apply. Not valid 12/22-1/2.